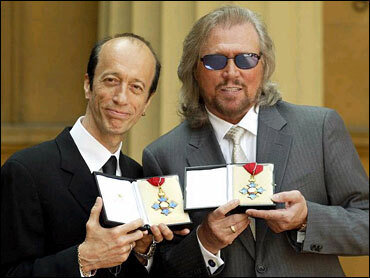 Barry and Robin Gibb, who went to Buckingham Palace to be honored Thursday, said the Bee Gees died with their brother Maurice. During an emotional ceremony, Prince Charles made the brothers Commanders of the Order of the British Empire, or CBE. Maurice's son Adam received the award on his father's behalf. "It's bittersweet. It would have been wonderful for all three of us to be here," Barry Gibb, 58, said afterward. "We have mixed feelings. Knowing Mo, this would have been right up his alley. "He would have still had his hat on," a reference to Maurice's beloved black trilby, which he wore constantly. Adam Gibb, a 28-year-old film student, looked close to tears after collecting his father's CBE. "My mother was supposed to do it, but she wouldn't have been able to" because of the emotion, he said. Maurice's widow Yvonne watched from the audience instead. In the 1970s, the Bee Gees were kings of the disco scene with hits such as "Stayin' Alive" and "Night Fever," and have now sold more than 110 million copies of their 28 albums. Maurice Gibb died in a Miami hospital at the age of 53 on Jan. 12, 2003. He had suffered a heart attack during emergency surgery for an intestinal blockage.